One advantage of getting on the CSS/XHTML bandwagon (i.e. not just standards-compliant design, but truly separating markup from presentation) is that different style sheets can be swapped in, totally modifying the appearance of a site, without requiring any tag-level changes at all. This has been demonstrated to great effect in the CSS Zen Garden, and can be seen from time to time in the form of style sheet switchers on sites. However, even if a site's designer doesn't deem to provide alternate stylesheets, most modern browsers support client stylesheets that can override the appearance. Most of the time these are used for little tweaks such as hiding ads from common providers or disabling link underlining in browsers that do not specifically have such a feature (Safari). However, there is nothing stopping one from going all out with client stylesheets and completely revamping the appearance of a site to suite one's aesthetic sense (or lack thereof). To this effect, I have made a stylesheet that is designed to override the appearance of Gmail, not necessarily because I think my take on the UI is that much better, but because I wanted to show that it could be done. One traditional limitation of client stylesheets is that they are applied to all sites indiscriminately, making it difficult to target specific ones. Mozilla 1.8a3 and later do in fact support per-domain CSS rules, but this doesn't help us with my browser of choice, Firefox (starting with version 0.9, Firefox is on a separate branch for stability reasons, and changes such as this one won't be picked up until version 1.1). However we can use the URLid extension, which provides very similar functionality (it assigns the domain of each site as the id attribute of the current page's <body> tag; since all other nodes are children of it, it is easy to restrict rules on a site basis). The stylesheet itself is nothing special, just a basic makeover with a different color scheme. Its one trick is to leverage Gecko's (decent) support for the :hover pseudo-class and the content attribute to allow a bit more information to be shown about each message when it is moused over in the mailbox view. For on-the-spot examinations of the DOM hierarchy and for checking to see which styles were being applied, I used the always-handy Web Developer Extension. The extension also had the added benefit of allowing me to modify and reapply the stylesheet without restarting Firefox via the "Apply User Style Sheet..." command from the "CSS" button. Writing the actual stylesheet was somewhat tedious since the code is somewhat convoluted, unlike the academic-like cleanness of the CSS Zen Garden markup. Styles are sometimes inlined, thus one is compelled to use the !important value in order to override them. Of course, once you start using that for your base elements, your child elements have to use it as well, lest their properties be overridden as well. However, the number of hacks was kept to a minimum, and Mozilla-only features such as -moz-border-radius and -moz-opacity made life easier. I have v1.4. How do I use CSS with this version? I've tried to get this to work on several different machines. Main system I tested with is using FireFox 1.0.7, URL id 0.1, Tabbrowser Preferences 1.2.8.3, miniT 0.5, Foxytunes 1.1, A9 Toolbar 1.3.1.154, and ChromEdit 0.1.1.1. Really trying to get this to work correctly, as the white gMail background is very literally painful when I happen to be having a migraine. ^ I believe updates in gmail have broken the stylesheet; i get the same thing when i try to install it. Not sure if Mihai is planning on updating it though. Just wanted to let you know that, as far as i know, you weren't doing anythign wrong. No more URLid, just place this code in the userContent.css file of the chrome dir of your profile. It almost function as should, the only missing point is the gmail logo, y hope someone more skillful than me can fix this. I hope not to clutter this tread with too much text, I just want to keep alive the gmail skinnig. 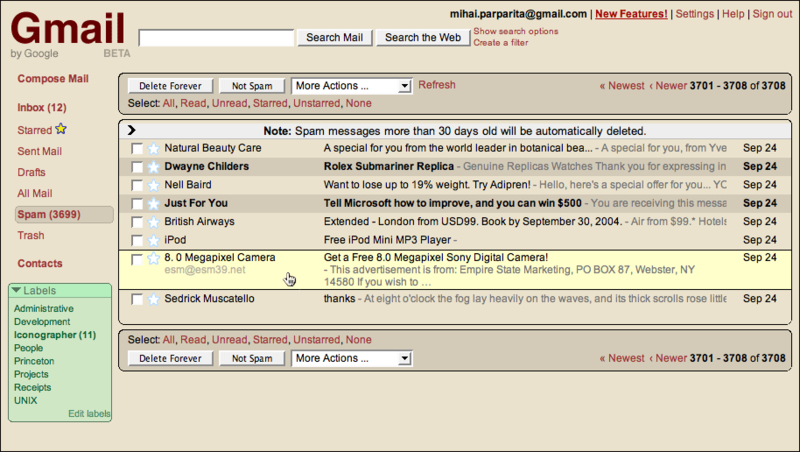 i have tried a lot to change the look of gmail. but i can't. can u please help me to solve this prob. i had done everthing.but css is not apiicable to my gmail. what can i do???? My wife is sheating me with a friend. They 're communicating with Gmail. I'm desperate. What can I do? It dosen't seem to do anything with ff 1.5 I used den's code since 1.5 have the functionality from URLid built-in, but I'm not seeing anything at all changed in Gmail. I am sending an email out and testing it on different platforms. is being ignored. On other platforms, it is working. Any ideas? URLid is an interesting Idea. I like the style sheet shown above so much I might use the colors in a page I'm designing. A tip to homey - if you ever do sniff someone's password (like a cheating wife) never admit it to anyone - because technically that's a computer crime you could be prosecuted for. And if the sh*t hit's the fan in an upcoming divorce - you know her lawyer could use that against you. Or at least give her another way to hurt you. how do i make this thing work? send me on my email please! i cant seem to get it to work for the quick contacts. After loading the skin, the top portion that has the webclips, and some buttons such as Archive, is blue. Also, the quick contacts, labels, items to the left are blue and gree -- these items seem to have not picked up the css changes. Do I just need to edit some lines in the css file? 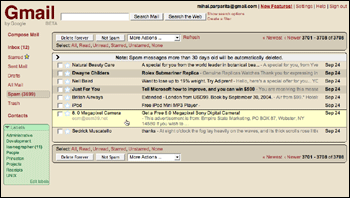 Can you develop a version for userstyle. Is there an equivalent method to do this in IE?